A Shropshire sand and gravel company is supporting a programme of work on one of the biggest dams ever to be built in Britain – over 50 years after they first won a contract for the project. 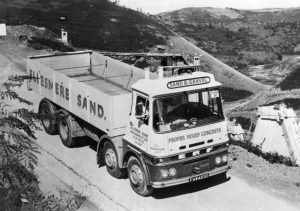 Tudor Griffiths Group, from Ellesmere, first won the contract to supply sand and gravel for the building of the Clywedog Dam in 1964. And now the family-owned company has once again been called upon to supply its products as part of a scheme to install a new hydro-electric system in the lower basin of the dam. Managing Director Tudor Griffiths said: “It’s such a great feeling to be working on the dam so many years after my Grandfather first won the initial contract. 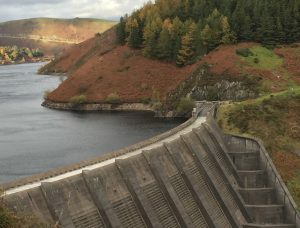 The Clywedog Dam was built to eliminate flooding in the upper Severn valley, creating a domestic water supply for a large area of Wales and England, and also generating electricity. The site is three miles from Llanidloes and 60 miles from the Tudor Griffiths head office and quarry in Ellesmere. “When the dam was built, it really was an incredible feat of engineering, and to ensure we could supply sufficient amounts of sand and gravel, my Grandfather hired every available tipper within a 30-mile radius of Ellesmere,” said Tudor. Once the dam was complete, the area was landscaped to make it look like a natural lake and the water was stocked with 17,000 trout. The Clywedog Sailing Club was also formed. 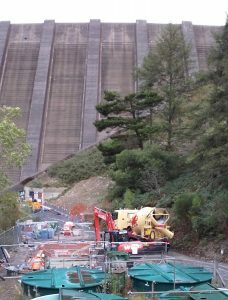 The current project on the dam involves the installation of a new 100 kilowatt hydro-electric system on the weir wall at the lower basin of the dam, and Tudor Griffiths is working alongside the appointed contractors, Bentleys.